Selling stock options is all about generating a cash flow. Calculating our initial profit, the potential for more profit (upside potential) and the protection of our initial profit (downside protection as opposed to breakeven of the entire position) is critical in making the most educated investment decisions. Accessing this information from the “Multiple Tab” of the Ellman Calculator will assist us in stock, option and strike selection. We then make our decisions based on market tone and technical analysis. In the chart above, we see, highlighted in yellow, out-of-the-money strikes which offer excellent initial option returns and the possibility of significant additional profit from share appreciation. The areas shaded in green represent in-the-money strikes which also provide outstanding 1-month returns, no upside potential but significant downside protection. It is important to note that when I refer to “downside protection”, I am referring to protection of the time value of the option premium, not the overall position. When we sell an option, the protection of the total position, or breakeven, is the entire option premium. For the past few months I have been “laddering strikes” or mixing ITM and OTM strikes. This choice is based a moderately bullish market outlook tempered by global concerns especially the European debt crisis. The power that this tool offers us is that once we have screened out greatest performing securities we can make our final stock and option decisions based on common sense principles and mathematics. This page can be printed and brought to your computer when you are ready to start generating cash into your accounts. JCP has been removed from our list (and eligible for screening) since it no longer reports on a monthly basis. In addition, ASNA (Dress barn, formerly DBRN) no longer reports sales stats monthly so it, too is longer a “banned” stock. Also, please make sure WMT is on your list. This updated list is archived on the premium site in the “resources/downloads” section. BCI: Moderately bullish selling an equal number of ITM and OTM strikes. I’ve received quite a few emails asking why I am not more bullish in my investment approach. Although I am optomistic about the US economy global concerns as we experienced this past Wednesday can still impact our markets in a big way and I am more comfortable with that cushion of selling half ITM calls. Another great article. Thanks. Can you explain how you get the downside protection percentage. My calculations differ slightly. Thanks again. This means that the ENTIRE 4.5%, initial option return (time value) will be realized as long as the stock price does not decrease by more than 5.7% during the contract period. I just watched the first 3 videos in the Beginners Corner. Really helpful. Thanks for thinking of us newbies. The Weekly Report for 03-09-12 has been uploaded to the Premium Member website and is available for download. Can you explain “ER date inaccurate” when it appears in the comments section of our weekly reports? ER dates without specific confirmation (usually from EarningsWhispers.com) tend to be best guesses. When we check for ER dates, we check multiple sources to see if there is any “agreement” of the ER date. The few times when we only can find only one source that has a date, we call the date inaccurate and the data tends to be inaccurate. This week, only IBD had ER data for these two stocks. Since we couldn’t get confirming data from EarningsWhispers.com, Yahoo, and Earnings.com…we added the note so you would not make any decisions based on inaccurate data. As mentioned in a number of past postings, we use EarningsWhispers.com as our “source of truth” because it has been the most accurate over the last few years. Are all the options in the spreadsheet from this article eligible? How can we tell from the percentages if any are considered too volatile like your Taser example in your first book? Yes they are all eligible and based on your market assessment (I publish mine on the weekly blog articles) you can favor ITM, ATM or OTM strikes. The “Taser” example I wrote about in “Cashing in….” was to point out the severe cost of selecting a security solely based on premium return. In the above spreadsheet, the equities were selected based on the strict screening requirements of the BCI methodology. Now, if I see a return of > 7% for an ATM strike I will (more often than not) avoid that equity/call trade because the implied volaility of the option tells me that the market is anticiapting a large price movement that can be in either direction. I noticed that you added ASNA to your stock list this week. My wife loves Dress Barn so I looked at the options. The 42 and 43 April calls both return about 3%. How would you decide on which one to use? Thanks for any assistance. Depending on your market assessment and personal risk tolerance the calculator will show you the choices from which you can make your best possible decision. Thank you for adding the subscribe without commenting. Is it possible to make that permanent for all weeks? I like to follow the discussions by email on my phone – it’s easier then going to the web site. Thanks for your great suggestions that have helped enhance the quality of this site. I am frequently asked to write articles, present seminars (Atlanta- April 14th and NY- May 8th) and get interviewed in venues other than this site. I accept as many as possible with the intent to reach the largest audiences possible. However, there will NEVER be new information disseminated at these venues that haven’t first been published on this site. My primary loyalty is to you, our members. 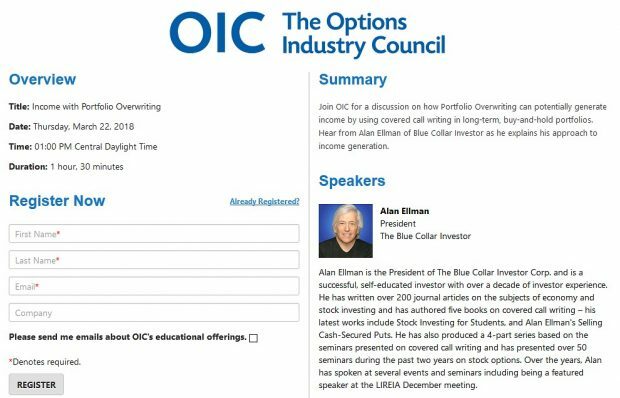 By appearing in these other locations I can reach more retail investors and hopefully play a role in assisting more Blue Collar Investors to become CEO of their own money. When I publish an article in other venues, it was previously published on this site either a few months ago or in some cases a year or two ago. I currently own PII at a cost basis of about 61 and sold the March 70s. The price is about 66.50. If the option expires out of the money what is the best action to take considering an earnings release on April 19th? Thanks. If you like the stock and want to keep it, you can buy a protective put and pay for it with a call, forming a “collar”. This will protect your position through earnings. After the ER you can decide how to trade the position based on the post-ER price behavior…knowing that your position is protected through earnings. See page 204 of Alan’s new book. Either sell the stock before the earnings report or “own the stock through the earnigs and then sell the option after earnings are reported and the price settles down”. I got 3 “doubles” this month and INVN was one of them. Would it be possible to put page numbers at the top or bottom of the weekly stock screen and watch list? Sometimes I print the front and back of the sheet of paper and it would be helpful. I’ll see what I can do to change the footed. Most of the stocks I selected from our list are higher than the strike prices I sold (it’s been a good month!). When do you start calculations for rolling the options? Thanks a lot. I’m in the same situation with most of my options. I plan to wait until friday afternoon so the time value of the march options gets as close to zero as possible. Good luck. Like Amy, I roll my options as close to 4pm EST on expiration Friday as possible. If I’m busy that Friday, I’ll execute these trades on Thursday. Just thought I’d share my first virtual trade following your course after one month!! By 03/12/12 share price for LPSN was 16.50 (almost 11% growth in share price) and I deemed this to be deep in-the-money and thought about deploying the unwinding strategy. Plugging the figures into the calculator revealed that the ROO was going to be >2% for a 20 day period. i) I wonder if it would have been better to just let the option expire and take 3.7% (althought this does not take into considerations commissions)? Was this deep enough ITM to deploy this unwind strategy or should I have waited for further share price growth? ii) If you had done any thing differently!!? iii) Had I used this strategy too late in the cycle? iv) Could I have done anything better? I’m looking forward to this friday when I’ll be making decisions on the other 9 paper trades and learn from them. 2- Can we use the cash generated from the sale of the stock to set up a second income stream in the SAME month with the SAME cash? Since you closed your position 4 days prior to expiration Friday the answer is probably not. Some investors will close a position like this just to capture most of the profit and protect against a short-term catastrophic drop in share price. There is nothing wrong with this. For me, I like to see both criteria met so I would have allowed the option to get exercised and shares sold after expiration Friday or rolled the option Thursday or Friday depending on the calculations. If a stock is trading right at the strike price on expiration Friday does it pay to roll the option or shiould I let the option expire hoping the shares aren’t sold? If you plan to use the stock as part of your next month portfolio, I would roll the option. Even if the price is one penny above the strike it will most likely be exercised. The time value as 4PM EST is approached is near zero. If nothing else, you will save one commission. VAL is the 6th largest paint and coatings company in the world and has been on our premium watch list for 8 weeks. It trades at a reasonable 16x forward earnings. CEO Gary Hendrickson was bullish during a recent conference call as were analysts who project 17% earnings growth for 2012 and 13% for 2013. Share price has increased by 43% since December, 2011 and has outpaced the S&P 500 by 22% in the past year, 18.5% in the past 3 months. The momentum has continued as VAL has beat the “market” by 5% in the past month. Our “running list” shows an industry segment rank of “A”, a beta of 1.07 and a dividend yield of 1.70. 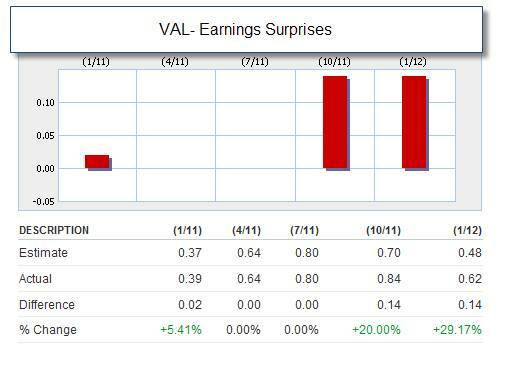 In 2011, VAL had 1 “meet” and 3 positive earnings surprises. See the chart below (click on chart to enlarge and use the back arrow to return to this blog). ***WE have also uploaded the 2nd quarter 2012 list of “High Dividend Yield Stocks with LEAPS”. Remember no trades after 4PM EST.